Greg Hettinger returns to Philadelphia and promises his closest friend, Jessie Dupree, that his hood-wearing vigilante days are over. But it’s a promise that he’s going to struggle to keep — especially when a gang calling themselves “The Crusaders” are prowling the City of Brotherly Love, scooping up “undesirables” and asking if they want to be saved… Collects THE BLACK HOOD issues #7-11 and as a special added bonus, VAMPIRONICA #1 by Greg & Meg Smallwood. Buy THE BLACK HOOD VOL. 2 at your local comic shop! Order THE BLACK HOOD VOL. 2 from the Archie Comics Store! Download THE BLACK HOOD VOL. 2 on the Archie App! Read THE BLACK HOOD VOL. 2 on ComiXology! The Mighty Crusaders are on the attack against the vicious Eliminators! It’s an all-out brawl with the odds in The Crusaders’ favor, until they’re faced with a new, dark entity: The Dream Demon! 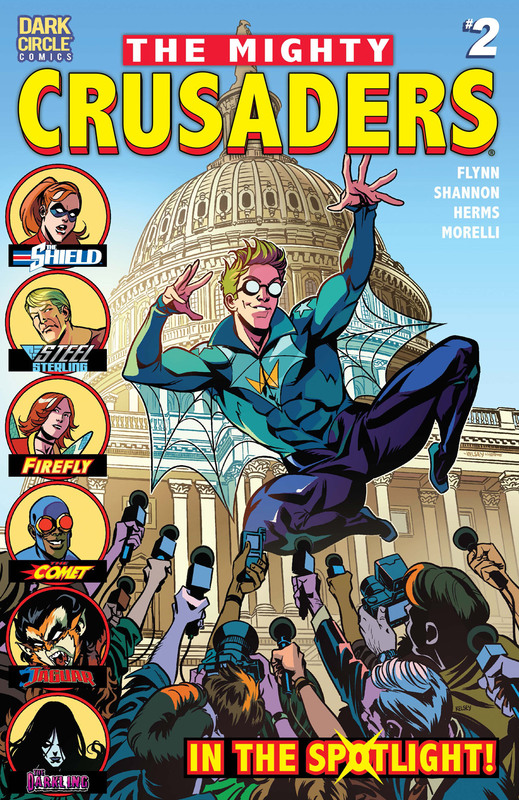 Join writer Ian Flynn (JUGHEAD), artists Kelsey Shannon (JOSIE AND THE PUSSYCATS) and Ryan Jampole, colorist Matt Herms and letterer Jack Morelli for high-octane super-hero action for new and returning readers in MIGHTY CRUSADERS #3! Get your copy of MIGHTY CRUSADERS #3 on 2/14 from your local comic book shop! the Archie Comics Store, or read it digitally on the Archie Comics App! The Mighty Crusaders have arrived! While new member The Web familiarizes himself with the rest of the team, the villainous Dr. Iddh holds a ritual that threatens to awake an evil unlike the world has ever seen! On January 10th, join writer Ian Flynn (JUGHEAD), artist Kelsey Shannon (JOSIE AND THE PUSSYCATS), colorist Matt Herms and letterer Jack Morelli for high-octane super-hero action for new and returning readers in MIGHTY CRUSADERS #2! 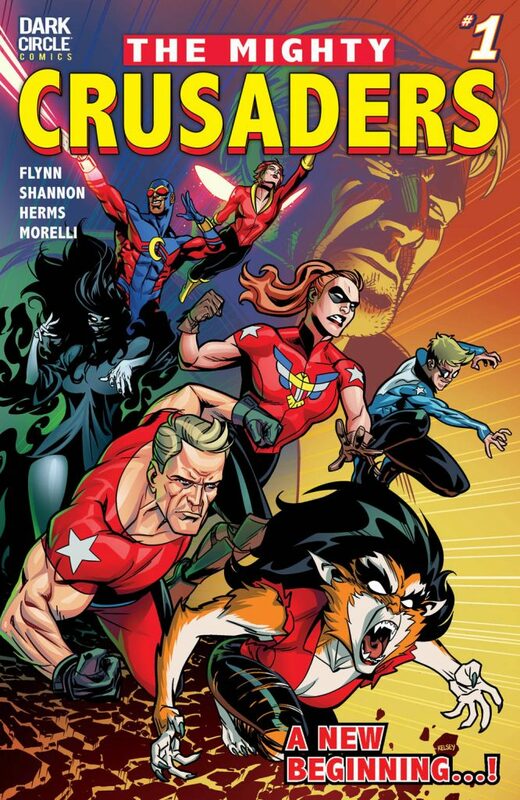 Pre-order your copy of MIGHTY CRUSADERS #2 today from your local comic book shop! Get issues of MIGHTY CRUSADERS delivered straight to your mailbox with a subscription from the Archie Comics Shop! 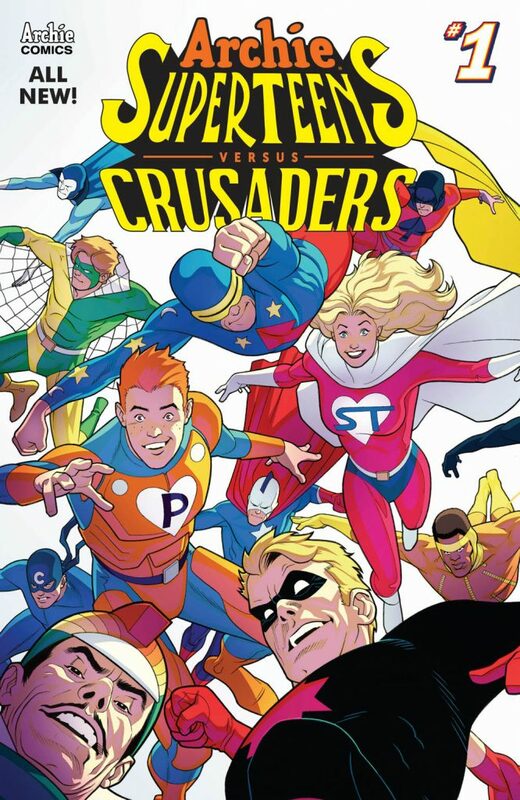 Archie Comics returns to the world of superheroes with a new ongoing series from the Dark Circle Comics imprint, THE MIGHTY CRUSADERS, launching in December from fan-favorite writer Ian Flynn (JUGHEAD, MEGA MAN) and artist Kelsey Shannon (JOSIE AND THE PUSSYCATS). “The Mighty Crusaders is one of those dream projects that you always hope for but never dare expect will actually happen. The best of the golden age through the lens of the present,” said artist Kelsey Shannon. GET READY FOR A NEW TRADE PAPERBACK COLLECTION PRESENTING THE BESTSELLING DEBUT ARC FROM THE ACCLAIMED TEAM OF SWIERCZYNSKI AND GAYDOS! A man driven to the brink, blacklisted and left brutally changed must crawl through the wreckage of his life to defeat a gang of deadly criminals hell-bent on setting the streets of Philadelphia aflame. The Black Hood is a visceral, modern crime noir tale told by two masters of the genre. THE BLACK HOOD VOL. 1 – THE BULLET’S KISS features an introduction from legendary crime writer Lawrence Block (A Walk Among the Tombstones and many more)! 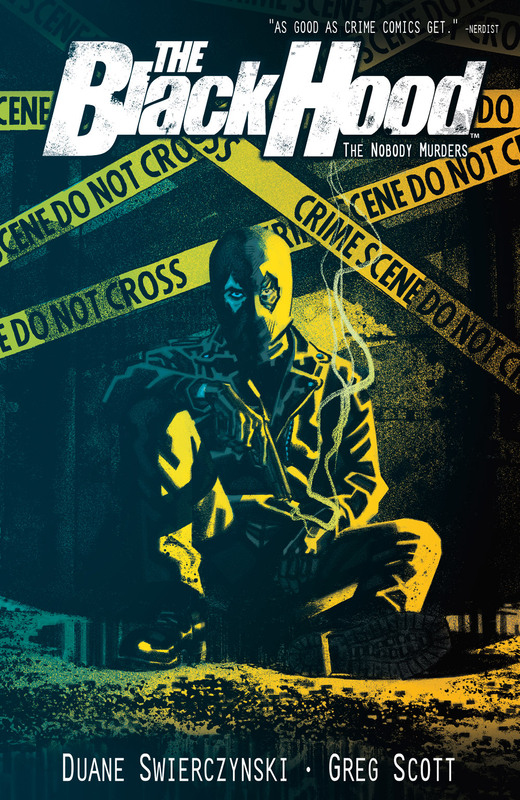 Get THE BLACK HOOD VOLUME 1 – THE BULLET’S KISS TP and other Dark Circle Comics at your local comic shop! Not sure where your nearest comic shop is? Use the Comic Shop Locator Service! No comic shop nearby? Order THE BLACK HOOD from the Archie Comics Online Store. The Black Hood has been on a long, winding road of bloody vengeance. Now he’s back to where it all began: the mean streets of the city of brotherly love. The bloodthirsty assasin known as The Nobody is ready to make his move on his ultimate target – and it’s not the person you’d expect. The Black Hood’s long-fought quest for justice comes to a shocking conclusion in this epic, must-read series finale by writer Duane Swierczynski and artist Greg Scott, on sale in comic shops and digitally June 14th. 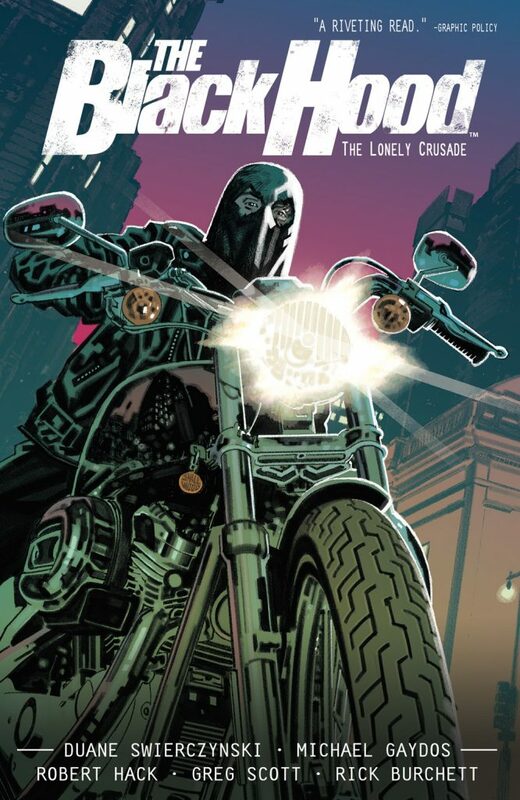 Get THE BLACK HOOD SEASON 2 and other Dark Circle Comics at your local comic shop! Not sure where your nearest comic shop is? Use the Comic Shop Locator Service! No comic shop nearby? Order issues of THE BLACK HOOD from the Archie Comics Online Store. You won’t want to miss a minute of the action in the penultimate chapter of THE BLACK HOOD SEASON 2!